My mother is my inspiration. Like me, she is an engineer, but she is also an expert seamstress, a florist, a handywoman, an interior designer, and baker extraordinaire. She’s all around fantastic. 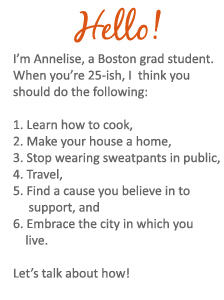 I’m a twenty-something graduate student in the Boston area. I love dinner parties, traveling, baking, movie soundtracks, quotations, and my snuggie. I own too much china. I rarely ever buy anything at less than 25% off. I don’t have a ton of money, but I don’t think that means I can’t do the things I want to do. I started this blog to share my experiences with others. If you are a grad student, twenty-something, post-doc, or just plain frugal, I welcome you here! Follow me on twitter for more frequent tips! And email me at annelise.blogs [at] gmail [dotcom] if you want to use more than 140 characters. Enjoy!